Will this passport take you to the end of your certification journey? 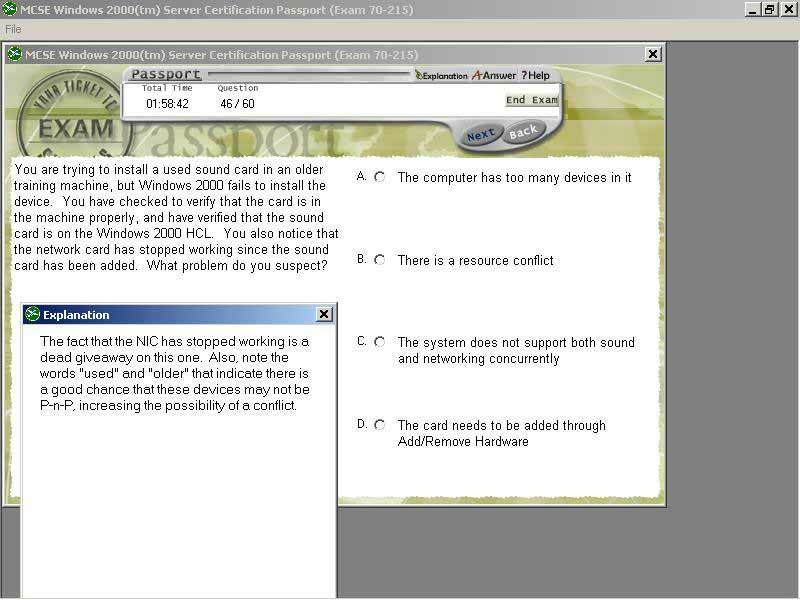 Here I go again: This month I evaluate yet another series of Windows 2000 exam preparation guides, the Mike Meyers' Certification Passports. My home office bookshelf is starting to look a lot like the certification section at Barnes and Nobles. The title of these books is a little confusing, as none of the ones I reviewed were written by Mike himself. Rather, they are written by a variety of authors with Mike's blessing. All the books have the same theme: "take these books with you on your certification trip and they will help get you to your ultimate destinationWIN2K Certified." Will these books really get you there or will you end up a lost tourist? Pack your bags and let's see. Each Passport is under four hundred pages and is comprised of between eight and ten chapters. Faithful to the travel theme, each chapter covers two to six "itineraries" (Microsoft official exam objectives). There are "travel advisories" scattered throughout which are technical tidbits that give you expert opinion on some common technical pitfalls and misconceptions. In addition there are exam tips that identify crucial areas you need to beef up on before taking the real exam. "Local lingo" blurbs help translate or define technical terms into plain English. At the end of each chapter is a "checkpoint," a set of review questions that help reinforce the objectives just learned and each Passport also comes with a CD that has a sample practice exam. I found these books to be quite readable with good laid-back technical explanations. The technical accuracy is fair with some corrections needed. For example, in the Win2K Professional book, the author states that when installing new Win2K Services on a machine that already has a Service Pack installed, the Service Pack would have to be reapplied. This is not correct, as Microsoft learned its lesson with NT Service Packs reapplications, programming Win2K to store Service Pack files in a local directory or to add registry entries that point to the Service Pack installation point so that a future Win2K modification would always find the latest drivers. This technical inaccuracy also highlights another weakness in the series: Each book has a different technical editor and between the guides there is inconsistency in the technical content. For example, the Win2K Server Passport has the correct information about Service Pack functionality. If the same editor had tackled the entire series, the same concepts should not differ. The Win2K Directory Services Passport also has some inaccuracies. For example, the section on DNS states that there are three DNS zone types: standard primary, standard secondary, and reverse lookup. In fact, the three DNS zone types are standard primary, standard secondary and active directory (AD) integrated. Zone types dictate where DNS records are stored, either in a text file (standard DNS) or in the AD database (AD integrated) and whether the DNS server has read-only (standard primary or AD integrated) or read-write (standard secondary) access to that data. Both forward lookup (computer name to IP address resolution) and reverse lookup (IP to computer name resolution) zones can be any of these types. There is also some overlap in technical content between the books in this series. This is to be expected, as the real exams also overlap in technical content. Many of the same questions/concepts show up on both the Win2K Professional exam and the Win2K Server exam. For this reason, it would probably be to your benefit to study both the Professional and Server Passports before attempting the Professional or the Server exam. Poor technical editing aside, the majority of technical content in this series is sound and is written in a refreshing style. The books cover most of the exam objectives and there is a good mixture of tables and graphics that help illustrate technical concepts. The end of chapter review questions are a different set than the ones you'll find on the companion CD. I found both sets of questions to be relatively simple and unambiguous but at the same time, some of the question answers did not match up to the explanations given. One question asked you to identify groups that could not share folders, and then in the explanation the correct answers were identified as those groups that could share folders. There was also some inconsistency between the chapter content and the questions asked. In the Win2K Professional Passport, in order to correctly answer one of the review questions you need to first understand how group policy filtering works, but in the chapter, group policy filtering is not even mentioned. It's highly doubtful that the real Win2K Professional exam would even ask you a question on group policy filtering, so it makes no sense for the Passport author to confuse the reader by including it in a review question to begin with. 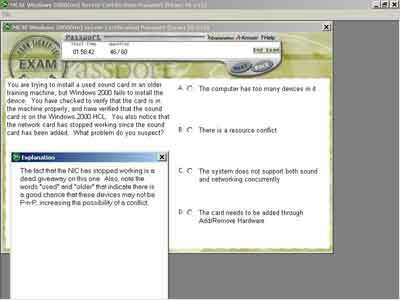 Each CD-based exam contains sixty questions that can be presented in either a "practice exam" mode where you can see the answers and explanation before ending the exam, or in "simulated exam" mode, where the answers/explanations are not available until the end. The exam engine is very basic consisting of single- or multiple-choice questions and some exhibits. Overall, the questions are adequate and help to reinforce technical concepts presented in the book. I found the answer explanations to be a little too short, and one thing that they sorely lack is page references to the appropriate concept sections in the books. Many times your dream vacation doesn't live up to the rosy picture in the poster on the travel agency wall. Studying for your certification with Mike Meyers' Passport in hand can have some of the same travel pitfalls. The Certification Passport series could benefit from better technical editing to correct some of the technical inaccuracies and inconsistencies both in the book content and with the accompanying practice exam questions. The CD-based exam explanations could be beefed up with better explanations and appropriate page pointers to book concepts. Despite these shortcomings, I do like the Passport series. With comprehensive exam objective coverage and an easy to read format, they are a good choice for Win2K exam preparation. Remember to study both the Win2K Professional and Server Passports before attempting either exam. Finally, as any seasoned traveler knows, a passport may get you in country but it is common sense and experience that will get you around.